Over the years, root growth from some trees and shrubs can infiltrate a home’s plumbing system or even cause cracks in a home’s foundation. But that doesn’t mean you have to have a yard free from foliage. Planning the right landscaping for your space means your pipes and your plants can coexist without a problem. Know where all of your sewer systems and pipes are in the yard. Use the national 811 “Call Before You Dig” number to find the location of underground utilities such as cables and lines before doing any landscaping. Measure the plant’s distance from your home to make sure there is enough space for the root system not to interfere with the underground pipes or foundation. Trees with spreading, water-hungry roots should be planted 20-30 feet from water and sewer lines. Plants and shrubs need enough water and nutrients in the soil so their roots do not infiltrate sewer and water lines to find it. Plant trees and shrub species with less aggressive root systems. Maintain your sewer system. Pipes are a source of water, nutrients, and oxygen that roots seek. Roots will grow quickly toward a broken pipe, making the situation even worse. 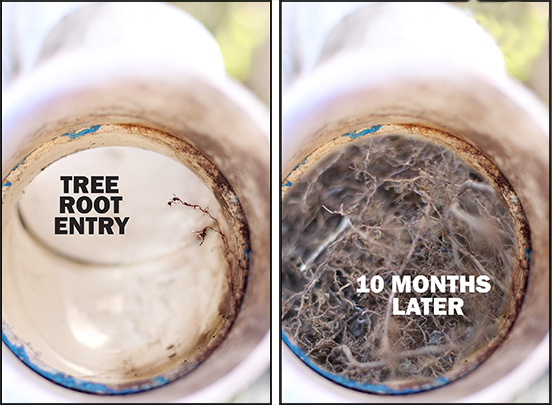 Use a root growth barrier to help discourage root growth near sewer lines. These slow-release chemicals steer roots from the sewer line path. Metal or wood barriers buried 6-12 inches deeper than the pipe and running vertically next to sewer lines can also serve as a physical barrier.Hindsight is 20-20, so perhaps you already have mature landscaping and are concerned that your plumbing issues are caused by tree root infiltration. Some warning signs that roots are in your sewer line include multiple plumbing fixtures backing up at once or a shower that backs up when you flush the toilet.If you suspect you may have roots damaging your plumbing systems, call Colvenback Plumbing and we can provide a video inspection of your service lines. Root infiltration of plumbing lines isn’t something that should be left untreated. Aggressive roots will continue to grow and compromise your entire plumbing system. Previous Post You would be astounded at the numerous expenses that pupils cover their school schooling, even though they’re in the identical income segment.